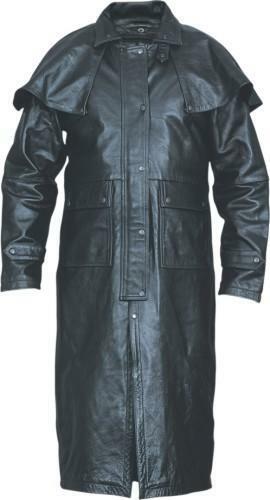 Leather duster is made from Buffalo Leather, It is a very tough leather. It has a zip out liner and the cape is removable. It has leg straps on the inside to keep the duster in place without falling off the legs. 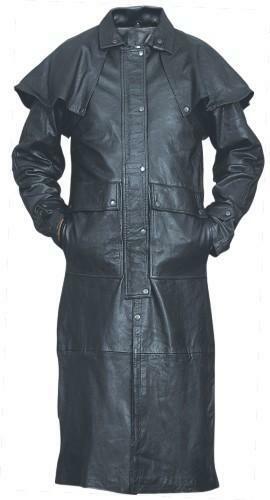 Black Duster in Thin Buffalo Leather. 2 front button pockets, with removable zip out liner, leg straps, and removable cape. Black Hardware. 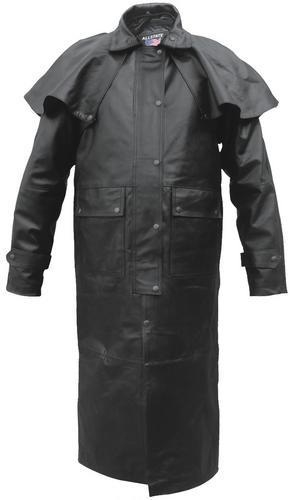 Leather duster is made from Split Cowhide Leather, It is an economical leather with all the same features as the other leather dusters at an affordable price. It has a zip out liner and the cape is removable. 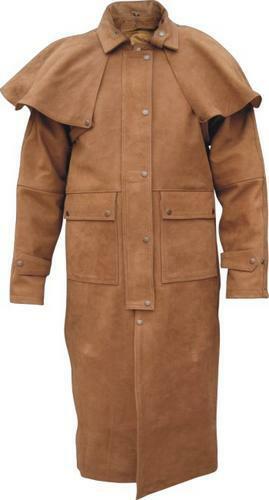 It has leg straps on the inside to keep the duster in place without falling off the legs. Dusters are made with extra room. They take into account the extra shirts and need for movement underneath. You want to find your biggest measurement. Put on the clothing you expect to wear underneath the duster. If you live in a warm place it may only be a shirt, other places it may be fleece or a hoodie, or maybe layers. Next take a tape measure and go around the largest part of your middle. Try to find a soft one for fabric but if you use a metal tape have a friend help. For some its the chest, others the belly. Keep the tape as horizontal as possible. This is the number you need. And when you add the extra 6 inches to allow for movement it should match below. You will probably want to order your normal size, dusters should have an extra 6 inches of movement room inside, Maybe one size larger or if you plan on wearing a winter coat underneath, maybe more. Really. Remember that leather is thick and doesn't move like cotton so do NOT plan for a snug fit, give yourself some room but no so much that you feel like your in an infant's snow suit.